Definition at line 199 of file llpreviewscript.h. Definition at line 1611 of file llpreviewscript.cpp. References LLMap< INDEX_TYPE, MAPPED_TYPE >::addData(), LLUICtrlFactory::buildFloater(), LLPanel::childSetAction(), LLPanel::childSetCommitCallback(), LLPanel::childSetEnabled(), createScriptEdPanel(), FALSE, LLUUID::generate(), LLFloater::getHost(), LLView::getRect(), gUICtrlFactory, LLUUID::isNull(), loadAsset(), LLTextEditor::makePristine(), LLScriptEdCore::mEditor, mItemID, LLRectBase< Type >::mLeft, mObjectID, mScriptEd, LLRectBase< Type >::mTop, onReset(), onRunningCheckboxClicked(), LLTextEditor::setFocus(), LLFloater::setTitle(), sInstances, LLView::translate(), and TRUE. Definition at line 1667 of file llpreviewscript.cpp. References mItemID, mObjectID, LLMap< INDEX_TYPE, MAPPED_TYPE >::removeData(), and sInstances. Definition at line 1690 of file llpreviewscript.cpp. References LLScrollListCtrl::addElement(), LLSD::beginArray(), closeIfNeeded(), LLSD::endArray(), lldebugs, llendl, LLScriptEdCore::mErrorList, mScriptEd, and LLScriptEdCore::selectFirstError(). Definition at line 1679 of file llpreviewscript.cpp. References LLScrollListCtrl::addSimpleItem(), closeIfNeeded(), lldebugs, llendl, LLScriptEdCore::mErrorList, and mScriptEd. Definition at line 2324 of file llpreviewscript.cpp. Definition at line 2329 of file llpreviewscript.cpp. References LLFloater::close(), LLWindow::decBusyCount(), LLView::getWindow(), mCloseAfterSave, and mPendingUploads. Referenced by callbackLSLCompileFailed(), and callbackLSLCompileSucceeded(). Definition at line 1591 of file llpreviewscript.cpp. References HELLO_LSL, HELP_LSL, onLoad(), onSave(), and onSearchReplace(). Definition at line 1974 of file llpreviewscript.cpp. References LLPanel::childGetText(), LLFloater::draw(), FALSE, LLViewerObjectList::findObject(), LLUICtrlFactory::getCheckBoxByName(), LLView::getVisible(), gObjectList, mAskedForRunningInfo, mHaveRunningInfo, mObjectID, LLViewerObject::permAnyOwner(), LLCheckBoxCtrl::set(), LLCheckBoxCtrl::setEnabled(), LLCheckBoxCtrl::setLabel(), LLFloater::setTitle(), and TRUE. Definition at line 2383 of file llpreviewscript.cpp. References LLMap< INDEX_TYPE, MAPPED_TYPE >::getIfThere(), and sInstances. Definition at line 2369 of file llpreviewscript.cpp. References LLView::getParent(), LLView::removeChild(), and sInstances. Definition at line 1706 of file llpreviewscript.cpp. References _PREHASH_GetScriptRunning, _PREHASH_ItemID, _PREHASH_ObjectID, _PREHASH_Script, LLMessageSystem::addUUIDFast(), LLAgent::allowOperation(), LLAssetType::AT_LSL_TEXT, LLPanel::childGetText(), LLSaleInfo::DEFAULT, DEFAULT_SCRIPT_DESC, DEFAULT_SCRIPT_NAME, FALSE, LLViewerObjectList::findObject(), gAgent, gAssetStorage, LLInventoryItem::getAssetUUID(), LLAgent::getGroupID(), LLViewerRegion::getHost(), LLViewerObject::getID(), LLAgent::getID(), LLViewerObject::getInventoryObject(), LLAssetStorage::getInvItemAsset(), LLPermissions::getOwner(), LLInventoryItem::getPermissions(), LLViewerObject::getRegion(), LLAgent::getSessionID(), LLInventoryObject::getType(), LLInventoryObject::getUUID(), gMessageSystem, gObjectList, GP_OBJECT_MANIPULATE, HELLO_LSL, LLInventoryItem::II_FLAGS_NONE, LLPermissions::init(), LLPermissions::initMasks(), LLAgent::isGodlike(), LLPointer< Type >::isNull(), LLInventoryType::IT_LSL, LLTextEditor::makePristine(), mAskedForRunningInfo, LLPreview::mAssetStatus, LLScriptEdCore::mEditor, mItem, mItemID, mObjectID, mScriptEd, LLMessageSystem::newMessageFast(), LLMessageSystem::nextBlockFast(), LLPointer< Type >::notNull(), LLUUID::null, LLStringBase< char >::null, onLoadComplete(), PERM_ALL, PERM_COPY, PERM_MODIFY, PERM_MOVE, PERM_NONE, PERM_TRANSFER, LLPreview::PREVIEW_ASSET_LOADED, LLPreview::PREVIEW_ASSET_LOADING, LLMessageSystem::sendReliable(), LLTextEditor::setEnabled(), LLTextEditor::setText(), time_corrected(), and TRUE. Definition at line 1673 of file llpreviewscript.cpp. Definition at line 1902 of file llpreviewscript.cpp. References LLVFile::getLastBytesRead(), LLVFile::getSize(), llendl, llwarns, LLTextEditor::makePristine(), LLScriptEdCore::mEditor, mScriptEd, LLVFile::read(), S32, and LLTextEditor::setText(). Definition at line 1870 of file llpreviewscript.cpp. References LLFile::fopen(), llendl, llerrs, llwarns, LLTextEditor::makePristine(), LLScriptEdCore::mEditor, mScriptEd, and LLTextEditor::setText(). Definition at line 2340 of file llpreviewscript.cpp. Definition at line 1826 of file llpreviewscript.cpp. References gViewerStats, LLViewerStats::incStat(), LL_ERR_ASSET_REQUEST_NOT_IN_DATABASE, LL_ERR_FILE_EMPTY, LL_ERR_INSUFFICIENT_PERMISSIONS, LL_ERR_NOERR, lldebugs, llendl, loadScriptText(), LLPreview::mAssetStatus, NULL, LLPreview::PREVIEW_ASSET_ERROR, LLPreview::PREVIEW_ASSET_LOADED, LLNotifyBox::showXml(), sInstances, and LLViewerStats::ST_DOWNLOAD_FAILED. Definition at line 1951 of file llpreviewscript.cpp. References _PREHASH_AgentData, _PREHASH_AgentID, _PREHASH_ItemID, _PREHASH_ObjectID, _PREHASH_Script, _PREHASH_ScriptReset, _PREHASH_SessionID, LLMessageSystem::addUUIDFast(), LLViewerWindow::alertXml(), LLViewerObjectList::findObject(), gAgent, LLViewerRegion::getHost(), LLAgent::getID(), LLViewerObject::getRegion(), LLAgent::getSessionID(), gMessageSystem, gObjectList, gViewerWindow, LLMessageSystem::newMessageFast(), LLMessageSystem::nextBlockFast(), and LLMessageSystem::sendReliable(). Definition at line 1924 of file llpreviewscript.cpp. References _PREHASH_AgentData, _PREHASH_AgentID, _PREHASH_ItemID, _PREHASH_ObjectID, _PREHASH_Running, _PREHASH_Script, _PREHASH_SessionID, _PREHASH_SetScriptRunning, LLMessageSystem::addBOOLFast(), LLMessageSystem::addUUIDFast(), LLViewerWindow::alertXml(), LLViewerObjectList::findObject(), gAgent, LLCheckBoxCtrl::get(), LLUICtrlFactory::getCheckBoxByName(), LLViewerRegion::getHost(), LLAgent::getID(), LLViewerObject::getRegion(), LLAgent::getSessionID(), gMessageSystem, gObjectList, gViewerWindow, LLMessageSystem::newMessageFast(), LLMessageSystem::nextBlockFast(), LLMessageSystem::sendReliable(), and LLCheckBoxCtrl::set(). Definition at line 2347 of file llpreviewscript.cpp. Definition at line 2271 of file llpreviewscript.cpp. References LLScrollListCtrl::addSimpleItem(), LLViewerWindow::alertXml(), LLUUID::asString(), dialog_refresh_all(), LLViewerObjectList::findObject(), gDirUtilp, LLAssetStorage::getErrorString(), LLDir::getExpandedFilename(), LLMap< INDEX_TYPE, MAPPED_TYPE >::getIfThere(), gObjectList, gViewerWindow, LL_PATH_CACHE, llendl, llformat(), llinfos, llwarns, LLLiveLSLSaveData::mActive, LLScriptEdCore::mErrorList, LLLiveLSLSaveData::mItem, LLLiveLSLSaveData::mObjectID, mScriptEd, LLFile::remove(), LLViewerObject::saveScript(), and sInstances. Definition at line 2241 of file llpreviewscript.cpp. References LLViewerWindow::alertXml(), LLWindow::decBusyCount(), LLAssetStorage::getErrorString(), LLMap< INDEX_TYPE, MAPPED_TYPE >::getIfThere(), LLView::getWindow(), gViewerWindow, llendl, llwarns, LLLiveLSLSaveData::mItem, LLLiveLSLSaveData::mObjectID, NULL, and sInstances. Definition at line 2012 of file llpreviewscript.cpp. Definition at line 2319 of file llpreviewscript.cpp. Referenced by LLPanelContents::onClickNewScript(), LLTaskLSLBridge::openItem(), and show(). Definition at line 2391 of file llpreviewscript.cpp. References _PREHASH_ItemID, _PREHASH_ObjectID, _PREHASH_Running, _PREHASH_Script, LLMessageSystem::getBOOLFast(), LLUICtrlFactory::getCheckBoxByName(), LLMessageSystem::getUUIDFast(), mHaveRunningInfo, LLCheckBoxCtrl::set(), sInstances, and TRUE. Definition at line 2409 of file llpreviewscript.cpp. References gSavedSettings, LLFloater::isMinimized(), LLView::mRect, LLView::reshape(), and LLControlGroup::setRect(). Definition at line 2038 of file llpreviewscript.cpp. References LLScrollListCtrl::addElement(), LLViewerWindow::alertXml(), LLUUID::asString(), LLScrollListCtrl::deleteAllItems(), LLViewerObjectList::findObject(), LLFile::fopen(), gAgent, gAssetStorage, gDirUtilp, LLUUID::generate(), LLCheckBoxCtrl::get(), LLViewerRegion::getCapability(), LLUICtrlFactory::getCheckBoxByName(), LLDir::getExpandedFilename(), LLViewerObject::getInventoryObject(), LLAgent::getRegion(), LLAgent::getSecureSessionID(), LLTextEditor::getText(), LLView::getWindow(), gObjectList, gViewerWindow, LLWindow::incBusyCount(), LLPointer< Type >::isNull(), LLTextEditor::isPristine(), LL_PATH_CACHE, llendl, llformat(), llinfos, llwarns, LLTransactionID::makeAssetID(), LLTextEditor::makePristine(), LLScriptEdCore::mEditor, LLScriptEdCore::mErrorList, mItem, mItemID, mObjectID, mPendingUploads, mScriptEd, NULL, uploadAssetLegacy(), and uploadAssetViaCaps(). Definition at line 2355 of file llpreviewscript.cpp. References NULL, open(), and sInstances. Definition at line 2145 of file llpreviewscript.cpp. References LLScrollListCtrl::addElement(), LLScrollListCtrl::addSimpleItem(), LLUUID::asString(), LLAssetType::AT_LSL_BYTECODE, LLAssetType::AT_LSL_TEXT, LLPanel::childGetText(), dialog_refresh_all(), FALSE, LLFile::fopen(), gAgent, gAssetStorage, gDirUtilp, LLUICtrlFactory::getCheckBoxByName(), LLDir::getExpandedFilename(), LLAgent::getSecureSessionID(), LLView::getWindow(), LLWindow::incBusyCount(), LLAgent::isGodlike(), LL_PATH_CACHE, llendl, llformat(), llinfos, lscript_compile(), LLTransactionID::makeAssetID(), MAX_STRING, LLScriptEdCore::mErrorList, mItem, mObjectID, mPendingUploads, mScriptEd, NULL, onSaveBytecodeComplete(), onSaveTextComplete(), LLFile::remove(), LLViewerObject::saveScript(), LLScriptEdCore::selectFirstError(), LLAssetStorage::storeAssetData(), LLStringBase< char >::stripNonprintable(), and TRUE. Definition at line 2130 of file llpreviewscript.cpp. 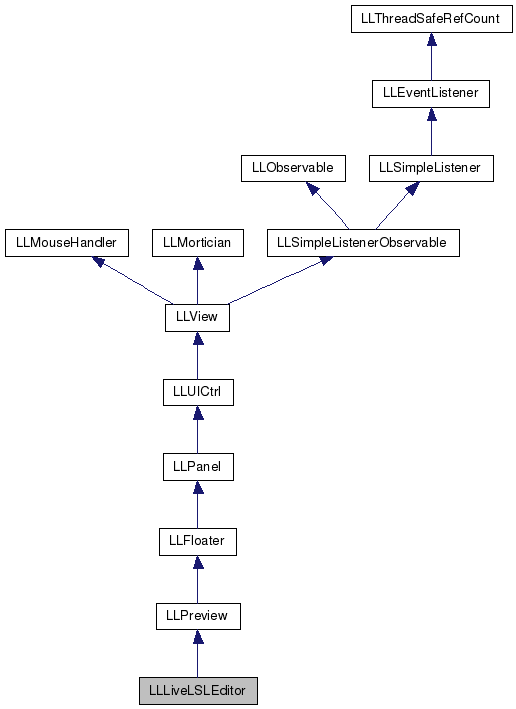 References llendl, llinfos, and LLHTTPClient::post(). Definition at line 268 of file llpreviewscript.h. Referenced by draw(), and loadAsset(). Definition at line 272 of file llpreviewscript.h. Definition at line 269 of file llpreviewscript.h. Referenced by draw(), and processScriptRunningReply(). Definition at line 264 of file llpreviewscript.h. Definition at line 271 of file llpreviewscript.h. Referenced by loadAsset(), saveIfNeeded(), and uploadAssetLegacy(). Definition at line 263 of file llpreviewscript.h. Referenced by LLLiveLSLEditor(), loadAsset(), saveIfNeeded(), and ~LLLiveLSLEditor(). Definition at line 262 of file llpreviewscript.h. 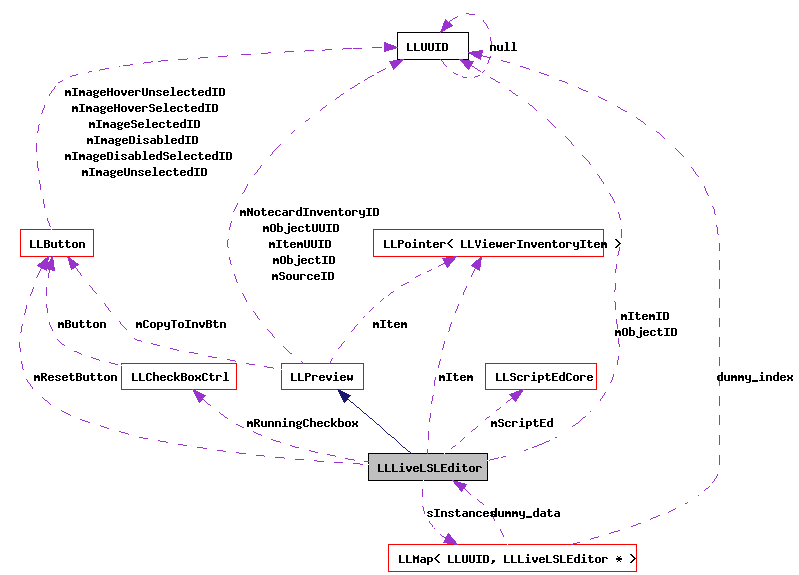 Referenced by draw(), LLLiveLSLEditor(), loadAsset(), saveIfNeeded(), uploadAssetLegacy(), and ~LLLiveLSLEditor(). Definition at line 274 of file llpreviewscript.h. Referenced by closeIfNeeded(), saveIfNeeded(), and uploadAssetLegacy(). Definition at line 270 of file llpreviewscript.h. Definition at line 267 of file llpreviewscript.h. Definition at line 265 of file llpreviewscript.h. Referenced by callbackLSLCompileFailed(), callbackLSLCompileSucceeded(), canClose(), LLLiveLSLEditor(), loadAsset(), loadScriptText(), onSaveBytecodeComplete(), saveIfNeeded(), and uploadAssetLegacy(). Definition at line 276 of file llpreviewscript.h. Referenced by find(), hide(), LLLiveLSLEditor(), onLoadComplete(), onSaveBytecodeComplete(), onSaveTextComplete(), processScriptRunningReply(), show(), and ~LLLiveLSLEditor().